never not dreaming: Black leather peplum. We're having a pretty nice spring this winter. If you were to pop out for lunch to a near-by cafe, you could easily leave your coat at the office. It feels kind of weird when one's wardrobe is still in the winter season but outside it's calling out for some colour, flower print and pastels. 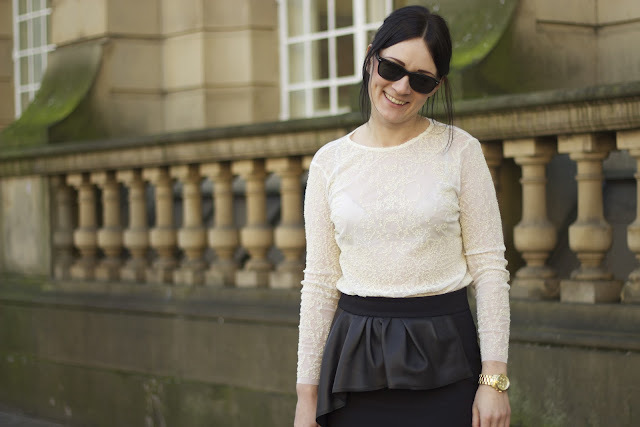 Today I was wearing another peplum skirt that has recently joined my wardrobe. It's all black with a leather detail. I pared it up with a sheer top to make the outfit look a bit lighter, more delicate. I love this top - it's very feminine and simply... me. It's a good piece to wear both at work and on a night out. It's one of my sale buys that I'm going to talk about a bit more tomorrow. What did you wear on this sunny day? Gold jumper and a peplum skirt. New in. Last sales buys. Shoes. Leopard and denim with a white shirt. Winter shorts in real winter. Camel and denim with a hint of burgundy.